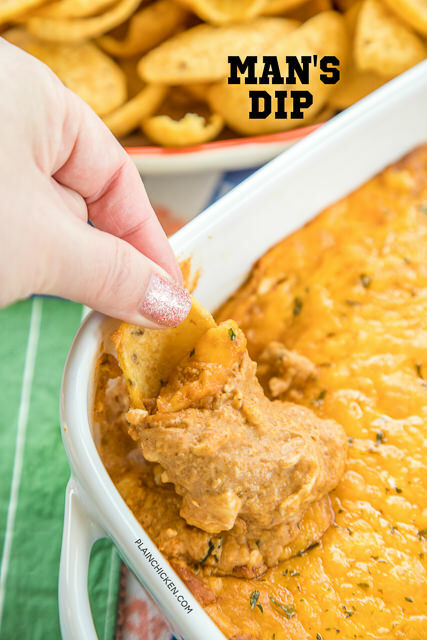 I have no idea why this is called Man's Dip, but I do know that this is a CRAZY good bean dip! This recipe is from one of my favorite cookbooks, and I've had this recipe on my "to-make" tailgating recipe list for years. I hate that I waited so long to finally try this dip. It was SO good. 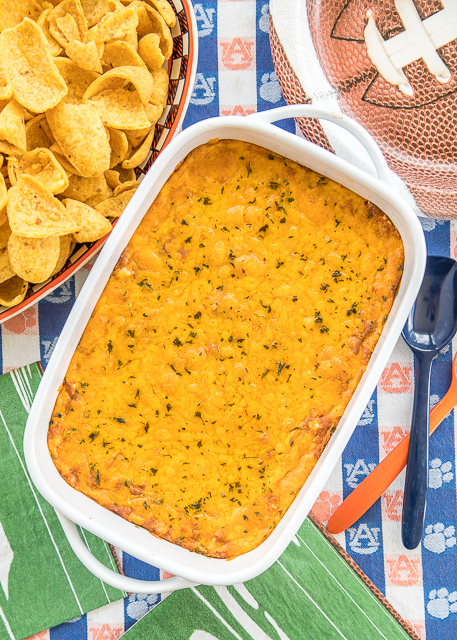 Think creamy Mexican bean dip with a kick. This Man's Dip starts with a can of bean dip. You add cream cheese, sour cream, taco seasoning, hot sauce and cheese. You can make this Man's Dip as spicy as you like. We added a few tablespoons of hot sauce and it had a nice kick. If you are sensitive to heat, start with a teaspoon of hot sauce. You could also use the canned bean dip with jalapeños in it. 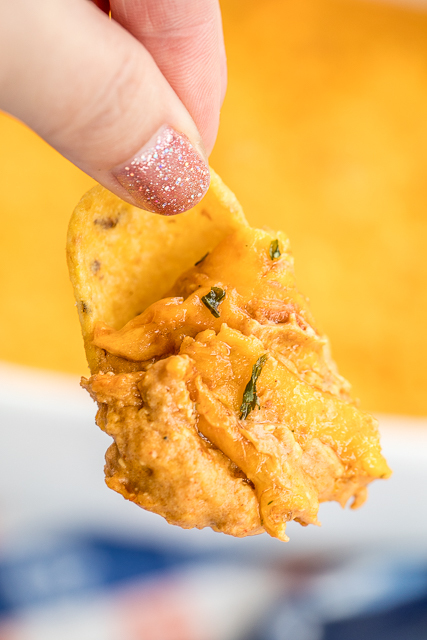 You could even add diced jalapeños to the bean dip mixture if you want to really make this spicy! 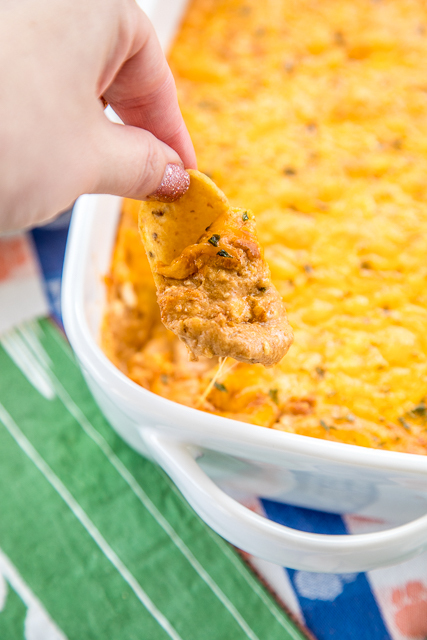 You can make this Man's Dip ahead of time and refrigerate it until you are ready to bake. We served this with Fritos. It would also be great with tortilla chips or some veggies (green pepper strips or celery). This was a HUGE hit at our tailgate. It was one of the first things to go. It has already been requested again for this weekend. Give this a try ASAP! I promise it will score a touchdown at your party! Preheat oven to 325ºF. Lightly spray an 8x8 or 11x7-inch pan with cooking spray. Set aside. Combine bean dip, cream cheese, sour cream, taco seasoning and hot sauce. Stir in 1/2 cup shredded cheese. Spread bean dip in baking dish. Top with remaining cheese. Bake, uncovered, for 25 to 30 minutes, until bubbly. Looks so yummy! I make a version of this that I am now going to call lady dip! I layer everything and leave out the sour cream, it is so good! I have made this for years. It's my absolute favorite dip. The only change in my recipe is I add sliced green onions. Yum!